Not all processes can be planned ahead of time - they arise from new circumstances. But once they have arisen, they should be managed. Think of a meeting and all the series of activities that are left to be done. Bizagi introduces a powerful and very dynamic capability that allows you to create plans, to help you control a series of on-the-fly activities directly from your Work Portal. With this feature you decide the activities that need to be done, the order in which they need to be executed (sequential or in parallel), establish due dates, the responsible person for each of them and have the possibility to include a checklist. 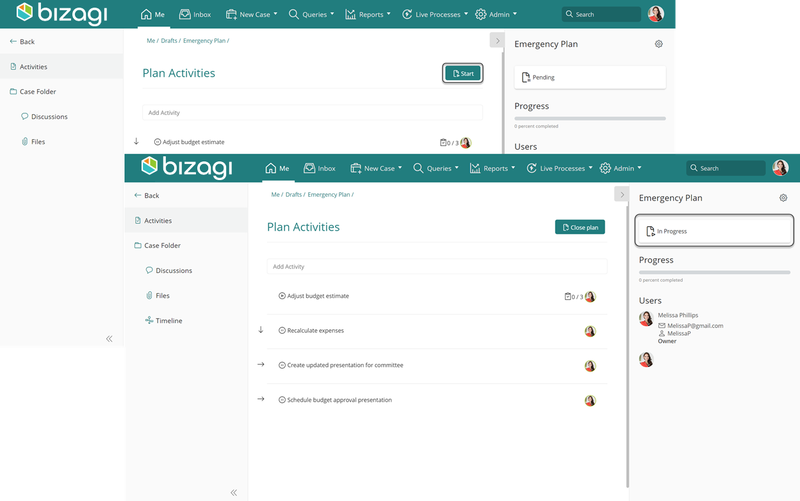 Bizagi Plans are presented and managed under the My Plans section. This section is part of the personalized Me menu, which is described at Me. Whenever a Plan is initially created, it falls into the Drafts status. Plans in the Drafts status move unto a Running status whenever its owner puts it to a start, by enabling the activities to be executed. Once started (in a Running status), inner activities of the Plan will appear in the allocated user's Inbox. Once a Plan (all its inner activities) has been finished, it falls under the Completed status. Finished Plans are done and these cannot be reopened, for which case, a new Plan can be crafted instead. 1. Plans are available for all Stakeholders. 2. Each Stakeholder can create his/her own plans when needed, rendering that Stakeholder as the clear owner/creator of that Plan (even though inner activities of that Plan are appointed to others). This means that such Plans are not shared per sé, but put into action in possible team work. 3. Users who have been allocated to activities of a Plan, can in turn create additional Plans for themselves. 4. There is no limit to the number of Plans that can be created, either for a Stakeholder or when drilling down into detail of a "sub-plan". Plans can be either created as standalone (not bound to any process), or as part of an activity of a process (a Plan inside of an activity). Refer to the guided steps to create Plans for either scenario. Imagine a meeting is has led to plan a series of activities to be executed that need to be controlled and followed-up. However there is no process created in Bizagi that is previously designed to support them. In this situation, we use Plans. 1. As the owner of the Plan and the responsible to design its activities, click Drafts at My Plans. Recall that this menu is presented only to end users who are explicitly categorized as Stakeholders. 3. Give a name for the new Plan. Notice that the first time, you won't have the option to choose from a template; however, you can select a template of a previous Plan if you have already created one that can be reused. 4. Define the activities that make part of that Plan. Do this by inputting the name of an activity in the text field, and hitting Enter when done. Click the created activity to edit its details: Goal it seeks to achieve, its Assignee, Due date, Duration and Notify on assignment. If you enable Notify on assignment users allocated will receive an email notifying of the new task. 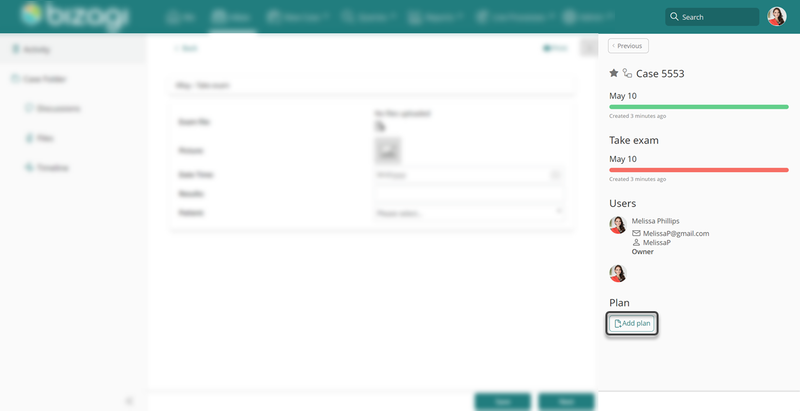 The notification received can be customized in Bizagi Studio's Business Configuration, in the notification named Notify on Plan assignment. Create additional activities by going back to the text field and repeating the same procedure described above. 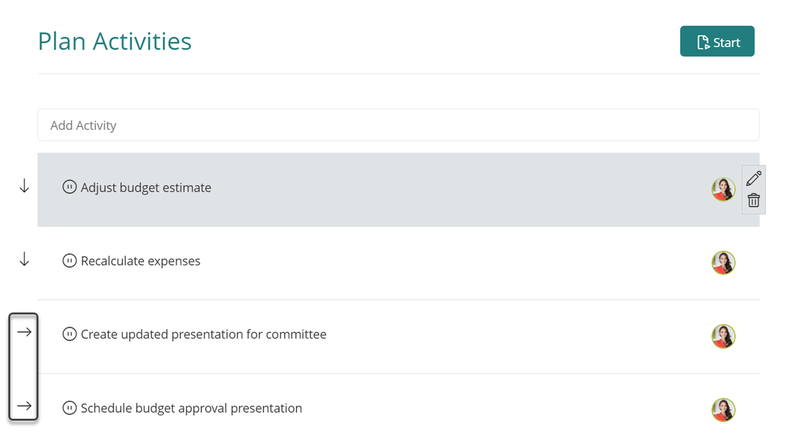 When done with the activities definition, click the Start button to put that Plan into action. As of this moment, the Plan will be running and you may view that now you have the option to close it if you choose to. Whenever a user is allocated to a regular activity that belongs to a process, it might happen that he/she requires the help from other colleagues to complete it. Plans are also available within ongoing activities that are part of processes. In this situation, we use Plans to define one that breaks down a possibly complex activity into finer-grained tasks. This type of Plan may be seen as a definition extending that allocated activity so that it details a checklist or series of steps. 1. As the end user working on an allocated activity, and while doing so, click on Add plan. Recall that working on an activity of a process does not demand that an end user has to be categorized as a Stakeholder. Any end user may define a Plan to get his/her colleagues' assistance as needed. At this point, the steps to define the Plan's properties (i.e Name) as well as its inner activities are the same to those presented when creating a standalone Plan. From within the activity that originated the Plan, you may manage that Plan by clicking the View Plan button. This will enable the edition view to add new activities, follow up the ones already created, or save the Plan as template or close it. Stakeholders can create as many activities as required. 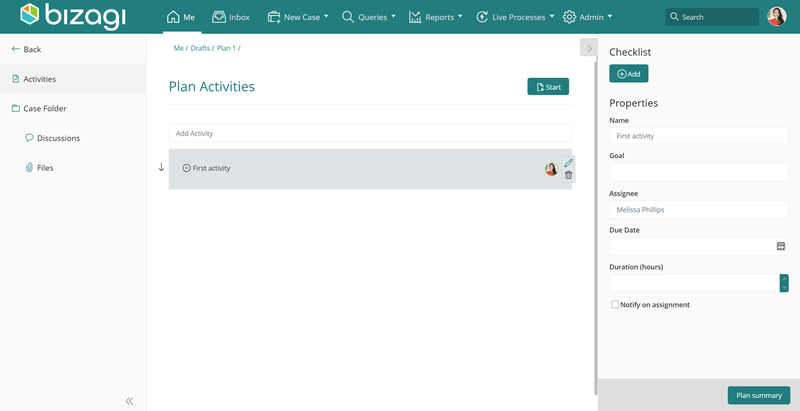 Activities inside of a Plan are shown to end users in the Work portal just as regular activities of a process are shown (listed at the Inbox). •The graphic query of the process option is not applicable. •The Following mark is not available given that the inner activity does not belong to a case per sé. •Even though the inner activity does not belong to a case, Bizagi generates a unique identifier so that you can easily locate such activity (i.e, from the search box). The identifier is automatically generated and it doesn't support custom naming or tagging (will not use prefixes, suffixes or custom sequences). Regarding defining these activities, whenever a Plan is created the Add Activity text box is displayed so that you can just type the name of the activity and hit enter to define as many as needed. You may create two or more activities to be executed in parallel. That is, they will be enabled at the same time and as they are completed the next non-parallel activity will be enabled. Note that by default, activities are set to be executed sequentially. 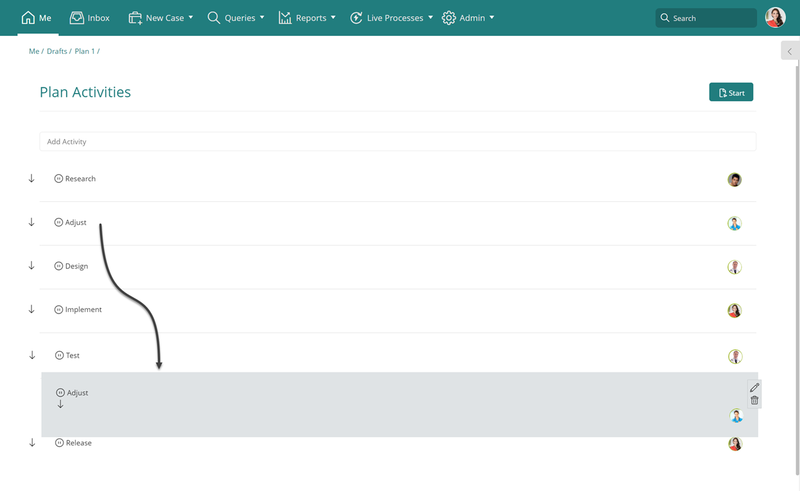 Therefore, to define parallel activities, click the arrow on the left of the activity name so that it switches to have a horizontal direction ( represents sequential, and represents parallel). When having two or more activities in a parallel mode, one after the other, they will be set to be executed in parallel. Whenever an activity is created (or selected), the right panel displays its details. •Checklist: A list of items which are presented each with checkboxes. Use the Add button for the Checklist, so that inner activities of a Plan present a checklist. Adding items to the Checklist is done by typing the name and hitting Enter. Items of the Checklist will work as mandatory fields in a form (means that in order to be able to complete the activity, the whole set of items of that checklist must be ticked). Note that regardless of adding a Checklist, end users will have the possibility of defining their own Checklist for them to tick upon completion. •Name: A descriptive name to identify the activity. •Goal: A meaningful description to elaborate on what the activity seeks to accomplish overall. •Assignee: The end user in charge of performing such activity. Make sure you type the username to select if from the autocomplete list. •Due Date: The date on which the activity is expected to be completed. Such SLA determines when the activity in the Inbox will be shown as overdue (expired), at risk, or on-time. When filling out a Due Date, it won't be necessary to fill out Duration. •Duration: The time in hours to which the activity is expected to be completed. 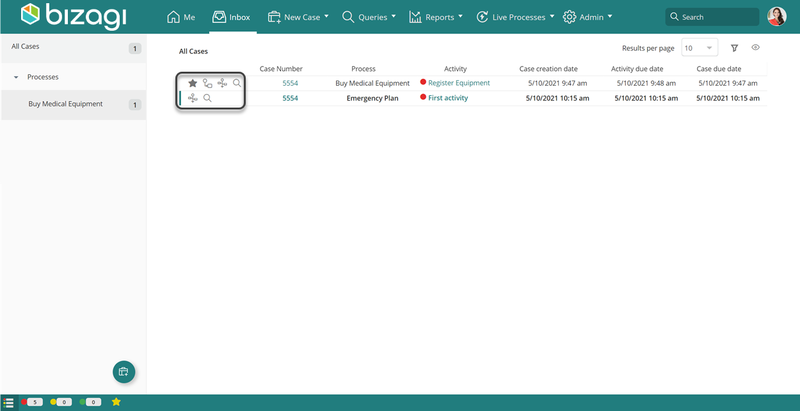 Such SLA determines when the activity in the Inbox will be shown as overdue (expired), at risk, or on-time. When filling out a Duration, it won't be necessary to fill out Due Date. To learn how a creator of a Plan may manage one (close it, edit it, delete it or save it as a template), refer to Managing Plans. 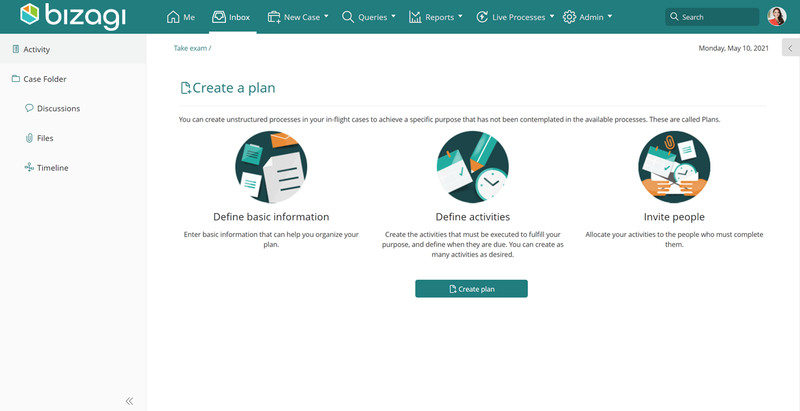 To learn how end users work with the appointed Plan's activities, refer to Working with running Plans.